Mauritian Philatelic Blog: My First Mail from Denmark! 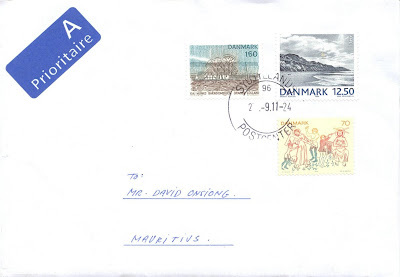 Thank you Lars for this cover posted from Sydjyllands Postcenter. :) If I'm not mistaken, the postmark indicates that the stamps were canceled at midnight! The 70 øre stamp was issued in 1973 and depicts the 'Crowned with Thorns, and carrying the Cross', a fresco in Biersted Church, Jutland, painted around 1400. The 160 øre stamp illustrates the childhood home of Kaj Munk, a Danish priest and resistance man during Second World War, killed by the Nazis in 1944. His home is situated in Opager, the island of Lolland. Finally, the 12.50 kr stamp was issued on 15 May 2002 along with three other stamps, each showcasing a landscape photograph by Kirsten Klein. Here its the district of Thy which is depicted.